Currently viewing the tag: "NRA"
But remember, the NRA’s answer is that more “good guys” need gun to help fight crime! By Zach W On October 9, 2015 · 1 Comment · In Crime, Guns & Gun Control, Idiocy/Lunacy, News, Those Kooky Conservatives! But remember….the NRA’s answer to crime is to make sure there are as many “good guys with guns” as possible. Here is what he should have said: Enough…I am coming for your mother****in’ guns! By Zach W On April 16, 2015 · Leave a Comment · In Guns & Gun Control, Idiocy/Lunacy, News, Those Kooky Conservatives! Apparently conservatives are all atwitter because country music superstar Tim McGraw will headline a benefit concert for Sandy Hook Promise, a group advocating for common-sense gun laws. Here’s something demonstrating just how extreme the NRA and gun rights activists have gotten. By Zach W On June 25, 2014 · 7 Comments · In Guns & Gun Control, Those Kooky Conservatives! Today’s National Rifle Association: standing up for stalkers and perpetrators of domestic violence. If citizens carrying guns help prevent crime, what happened in Las Vegas? By Zach W On June 6, 2014 · 3 Comments · In Guns & Gun Control, News, Those Kooky Conservatives! 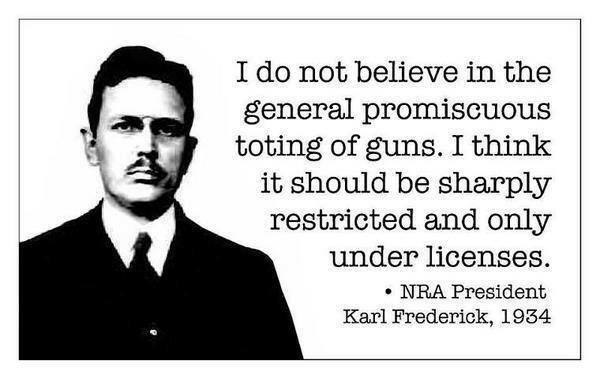 Well it certainly didn’t take long for the NRA to cave to its extremist base.